What’s with all these luxury electric cars? Mercedes already has three electric models but Volkswagen’s plans raised eyebrows among industry watchers as manufacturers usually start off with a mid-priced electric vehicle (EV). However, the German companies had seen U.S.-based Tesla not only enter the EV industry with a luxury car but enter the auto industry that way. Tesla “really succeeded in a moonshot” at creating the ultimate automobile, says industry watcher Matthew Klippenstein, who works as a professional engineer at SgurrEnergy in Vancouver and covers the EV market in Canada for the U.S.-based Green Car Reports.. In addition, Tesla was eating into Mercedes’, Porsche’s and Audi’s high-margin sales, even in countries like Germany and Switzerland, which don’t subsidize EVs. 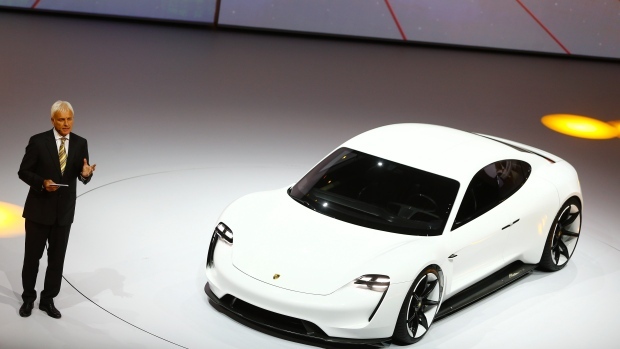 So the Porsche Mission E and the Audi e-tron Quattro, which will launch in about 2018, are an attempt to hang on to their existing customers by competing with Tesla’s offerings. “The luxury makers have realized the EVs offer a superior driving experience, as long as there’s adequate range for people’s needs,” Klippenstein says. The new luxury EVs can go at least 400 kilometres on a full charge. 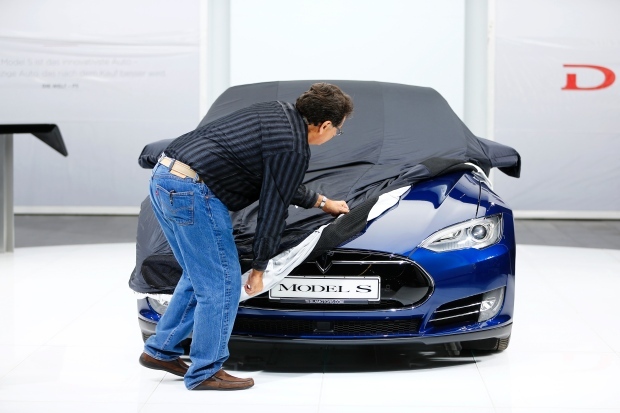 Ferdinand Dudenhoeffer, an automobile industry expert in Germany, says that Tesla’s Model S already outsells the Porsche Panamera and the Audi A8 in many markets. 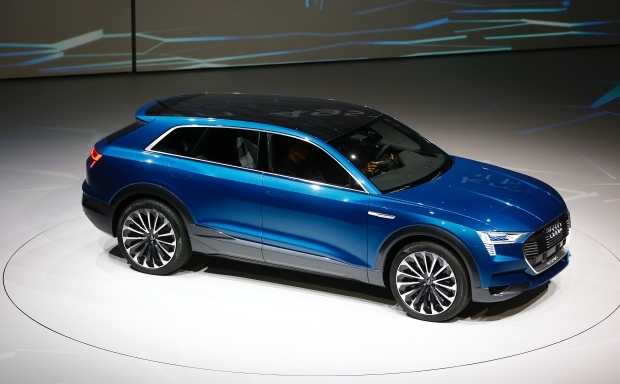 He expects the all-electric vehicle will surpass the plug-in hybrids and manufacturers will soon stop making hybrid EVs. Over the first seven months of 2015, Tesla sold 1,132 Model S cars in Canada, nearly double the sales of both the Nissan Leaf and the Chevy Volt, making it Canada’s bestselling EV this year. The Leaf has been the best-selling EV internationally, while the Volt is to-date the bestselling EV in Canada, at nearly 4,700. A spreadsheet that Klippenstein maintains has total new EV sales in Canada at 14,224 from 2011 to 2015. Tesla benefits immensely from subsidies, Klippenstein says. The Canadian government doesn’t offer an EV subsidy but the Quebec government offers up to $8,000 when you purchase or lease an eligible EV and Ontario offers $8,500. Both provinces also offer a $1,000 subsidy if you purchase and install an eligible charging station. In B.C., where Klippenstein drives a plug-in Toyota Prius, EV buyers can get up to $5,000 from the province’s clean energy vehicle rebate program, which resumed in April after a one-year suspension. Klippenstein says sales of the Leaf and the Volt fell in B.C. after the rebates were suspended and went back up after they resumed. Sales of the much-higher priced Tesla showed little effect. U.S. subsidies for EVs probably helped drive the new luxury electric car programs. There’s a federal tax credit of $7,500 for battery-only EVs, plus the possibility of state and other subsidies. In California, which accounts for nearly half the country’s EV sales, there’s another $2,500 rebate available for electric cars. But for low-income buyers, that subsidy rises to $4,000. Two months ago, the state eliminated the rebate for Californians with very high incomes, above $500,000 for households, half that for individuals. A 2015 survey by the California Clean Vehicle Rebate Project had found that 77 per cent of the households receiving the subsidy had incomes of $100,000 or more and 40 per cent of households reported $200,000 or more in income. “The primary beneficiaries of the subsidies have always been the automakers, who are required by CARB [California Air Resources Board ] mandates to sell a minimum number of electrics and plug-in hybrids or face fines,” writes Brad Berman at PluginCars.com. The tax credits are supposed to help the carmakers sell their EVs while finding ways to cut production costs, so they eventually can compete on price with gasoline-fuelled vehicles. The Wall Street Journal reported in August that, “Tesla’s entire market capitalization of $34 billion is nothing but the discounted present value of its expected future subsidies.” The Journal also said that Tesla generates millions of dollars in revenues by selling emissions credits to other carmakers. University of California Berkeley released a study in July that looked at the U.S. tax credits for EVs issued from 2006 to 2012 and found that 90 per cent of the credits went to the top 20 per cent of income earners. Some states are concerned about losing income from the taxes they charge on gasoline. They say those taxes help pay for maintaining the roads which EVs also use, so they levy an annual fee on EVs. The Alliance of Automobile Manufacturers has argued against those fees, saying they make drivers less likely to buy EVs. The group Taxpayers for Common Sense points to the hundreds of billions of dollars the U.S. oil and gas companies receive in deferred tax liabilities. Please comment below to tell us do you own a EV and how do you like your EV so far? If you don’t own one, would you like to switch to EV and why?